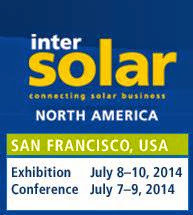 The Intersolar North America conference will take place on July 7 - 9, 2014 and the exhibit will occur on July 8 - 10, 2014. The conference will be held at the InterContinental Hotel San Francisco and the exhibition is located next door. Intersolar North America is the most-attended Solar Exhibition in the United States. This year's conference is set to reach a new level by covering the latest innovations, from PV and energy storage to solar heating & cooling technologies. This year’s program truly bridges solar theory and best practice. In the spotlight are a wide range of cost-effective installation trainings for installers and solar practitioners developed with Intersolar's partners SEI, NABCEP, CALSEIA, NAATBatt.